Over the coming decades, the number and share of U.S. households age 65 and over will rise dramatically as the oldest members of the baby-boom generation reach retirement age. Inevitably, with increasing age comes the growing presence of disability and problems using components of the home without assistance. Surely, some aging households will look to move into homes that are better suited to their changing needs, but the majority of older households continue to plan to “age in place.” Since much of the housing stock is currently ill-equipped with even basic accessibility features, older homeowners aging in place will need to invest in retrofitting their homes in order to age comfortably and safely. New research released by the Joint Center sheds light on the implications of an aging society for the home improvement market by analyzing the remodeling activity by older owners and estimating the projected demand for and supply of homes with basic accessibility features in the near future. Older homeowners have already been exerting significant influence on the home remodeling market due to changing trends in longevity, mobility, wealth, homeownership rates, and labor force participation. Since 2007, the share of total market spending for home improvements by owners age 55 and over has increased considerably, from less than a third to nearly a half by 2013. Reaching $90 billion in 2013, spending by older owners was just 6 percent less than during the last market peak in 2007 and for the first time surpassed the share and level of spending by middle-age homeowners. Combining historical spending data from the American Housing Survey with recent consumer housing survey data of expected spending from the Demand Institute suggests that total improvement expenditure by older homeowners could surge by an additional $17 billion annually over the next three years. 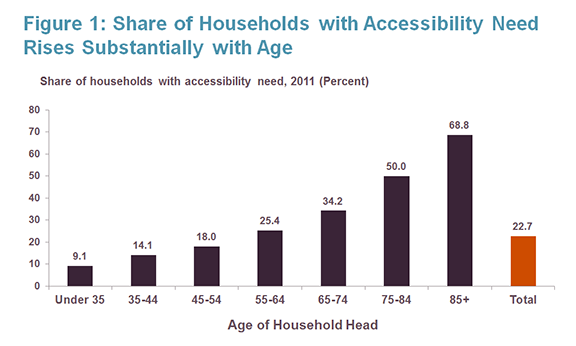 The Joint Center estimates that of the over 25 million households age 65 and over today, 44 percent have some need for home accessibility features due to disability or difficulty using components of the home, such as kitchen or bathroom facilities, without assistance (Figure 1). 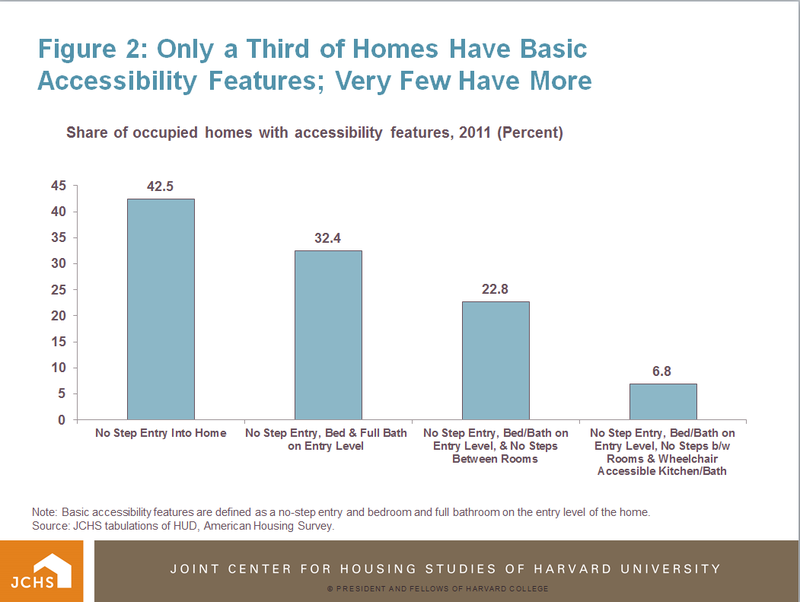 And yet the current housing stock is not especially equipped to meet the accessibility needs of an aging nation, as not even a third of homes have what could be considered basic accessibility features, such as a no-step entry and bedroom and full bathroom on the entry level (Figure 2). Although 45 percent of older homeowners plan to undertake improvement projects in the next several years with the intent of making their homes easier to live in as they age, surprisingly few owners are focused on home accessibility as part of aging in place comfortably and safely. Given the attitudes of today’s older homeowners, the remodeling industry will need to bridge a substantial mismatch between owners’ wanting to age in place and their actually being able to do so safely with appropriate accessibility features. Note: Households with accessibility need are defined as those with a disabled member or members with serious difficulties using components of the home without assistance. For more detail, see Appendix A in Abbe Will, Aging in Place: Implications for Remodeling, JCHS Working Paper, July 2015. Source: JCHS tabulations of HUD, American Housing Survey. 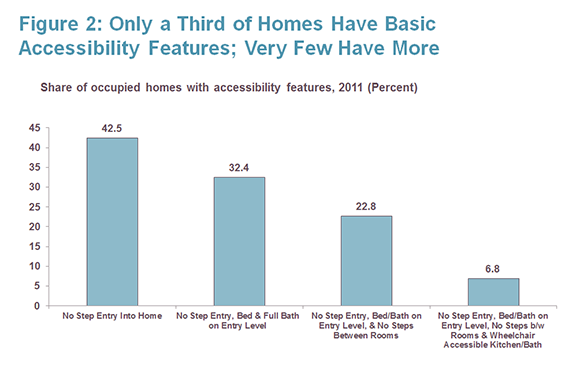 Note: Basic accessibility features are defined as a no-step entry and bedroom and full bathroom on the entry level of the home. Source: JCHS tabulations of HUD, American Housing Survey. 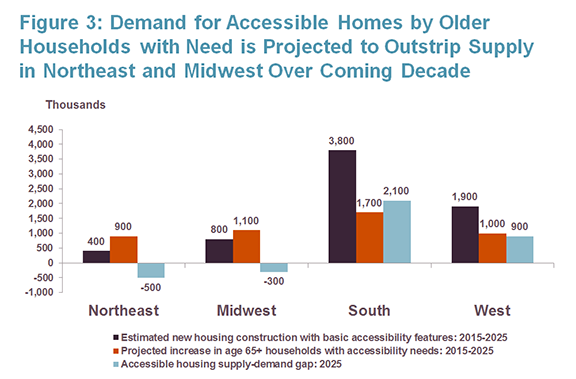 As the number and share of older households rise sharply over the coming decade, construction of new housing with basic accessibility features is projected to fall considerably short of increased demand in the Northeast and Midwest regions of the country. Fully 40 percent of the net gain in households age 65 and older with accessibility needs in these regions is projected to have unmet demand, suggesting the need for significant retrofit spending on existing homes to narrow this supply-demand gap (Figure 3). Older households in the South and West regions of the country are already better accommodated for aging in place, with relatively more homes in these regions having basic accessibility features, and this trend is not expected to change over the coming decade. 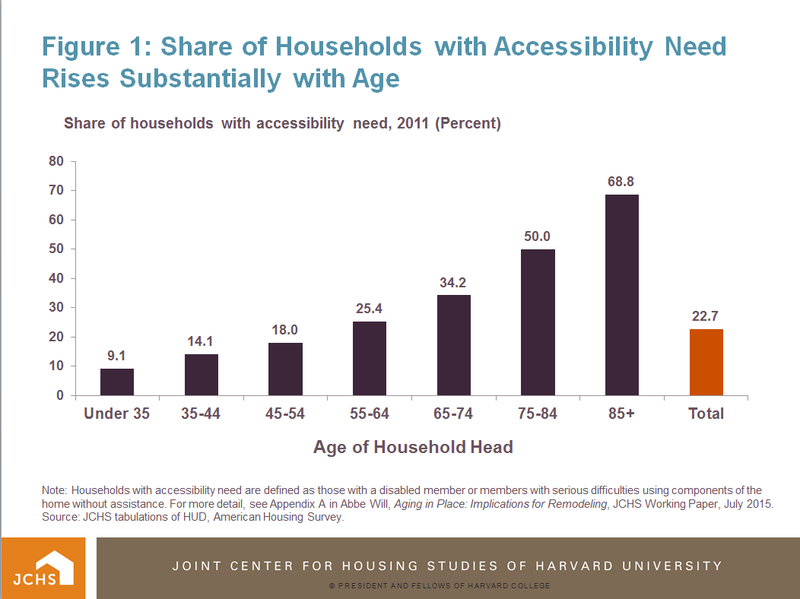 Ultimately, the dramatically rising number of older households aging in place, strong and growing home improvement spending by older owners, and the unsuitability of the current housing stock for safely and comfortably aging in place all support the expectation for substantial growth in demand for homes with accessibility features moving forward. Note: Basic accessibility features include a no-step entry and bedroom and full bathroom on the entry level of the home. Source: Abbe Will, Aging in Place: Implications for Remodeling, JCHS Working Paper, July 2015.